I’m really excited about Night in the Woods. I mean, yeah, I was excited before, after playing Lost Constellation early last year and seeing what these cute animal friends can get up to and the staggering amount of imagination and creativity to everything surrounding them and their antics, but now I’m even more excited. Unsurprisingly, this all stems from my recent dip into Longest Night, which is actually the first of the two supplemental experiences from Finji, though I’m tackling it second. You know I never like to follow anything by the book…unless it is the Metal Gear series in order of release. Longest Night is less game and more short story. Or short stories, rather. Snippets of fake history. A gang of four friends–Mae, Bea, Gregg, and Angus–gather around the campfire and trace constellations in the dark sky, bringing to life these legends of old. It’s a classic tradition as part of “Longest Night,” which is equivalent to Christmas or the Winter Solstice in this world. It’s become a part of life, and the older one gets, the further from it they go, which is why no one around the campfire remembers how to make any of the constellations, something they used to do all the time as little kids. To learn about these historical figures dripping with lore, like Ibn, the First Singer, Quinona, and Tollmetron, you have to trace matching stars to one another. Linked stars all share similar audio clues, so match all the chanting ones together, all the ones that sound like bells, and so on. It’s easy to figure out, if you know that you’re supposed to figure these sounds out. Honestly, I didn’t even realize you could click on them and draw lines to other stars; I thought the whole point of the game was simply to swipe your cursor around, making pretty tunes and enjoying the cackle of a campfire, but eventually I got the feeling I was missing something and started clicking. To be real, I don’t even know what Night in the Woods is about. I’m being ignorant on purpose; I want to be completely surprised, not just in terms of story, but also gameplay, much like I was going into both Longest Night and Lost Constellation. Sure, a part of me would like to see elements from these incorporated in the bigger adventure, like creating your own snowmen and music beats, but they could also scrap all of this and do something completely different, something totally unexpected, and I would still be content. From a few GIFs that I couldn’t help not look at, it seems like an adventure game with some varying and stylized action scenes here and there. Oh, and it looks gorgeous too. Lots of oranges and blues, falling leaves. Ahhhh. 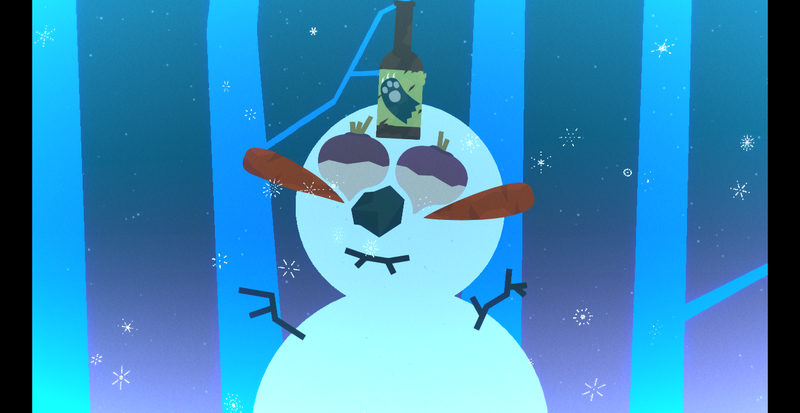 Now that I’ve played both of Night in the Woods‘ supplemental side stories, all that’s left to do is wait for its final release. Which is somewhere in 2016. Until then, I’ll be staring up at the stars, humming along to a song that never ends. Lost Constellation is all that, but condensed and only slightly related. In short, it’s a ghost story, a bedtime tale, a journey within a journey. Mae’s grandfather is the narrator, weaving together the night-driven adventures of Adina, a young alligator astronomer, and her journey to find a star, keep a promise. As she travels through the cold, harsh woods, Adina will stumble upon a number of interesting–if mostly untrustworthy–characters, like a blue fox that wants to sell wanderers coffins, a cat that is not a wizard cat, just simply a cat, an old, weather-controlling witch, and ghosts of the once living. Oh, and snowmen, but Adina makes those herself, rather than runs directly into them; more on that later. Gameplay is exploration-based, with Adina moving left or right, discovering items and characters to interact with. She can also pick up and carry snowballs, which are great for hitting things out of trees or summoning a guard via some rung bell. Expect plenty of dialogue to unfold, the majority of which is amusing and interestingly presented, and there is the occasional dialogue choice to make, though they never seemed like the sort of decisions that would change what might happen next. Merely a different way of asking the same thing. Maybe Night in the Woods will explore this deeper. The soundtrack by Alec Holowka is strikingly soft and eerie. Beautiful and off-putting. Happy adjective and sad adjective. Perfect for a walk in a strange forest under starlight. I’m personally a big fan of “Tundra” so much that I left the game up in a part where it played while I did some household chores, letting it loop (this was before I knew the developers had a separate site for it). The whole soundtrack actually reminds me a lot of Mass Effect, Transistor (minus the jazzy drums), and Fire Emblem: Awakening, all snowballed into one very low-key, laconic, haunting concert. Overall, I’m pretty proud of my work. 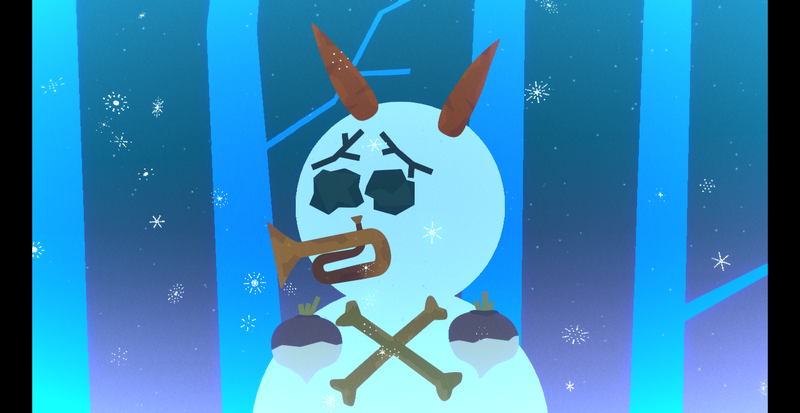 From what I’ve gathered based off screenshots and animated GIFs for Night in the Woods, it seems to be set in a modern city and during autumn, so this snowperson-crafting mechanic might not show up there. Perhaps we can help Mae create monsters from piles of leaves. Either way, I hope something like this is in there again, because, while not challenging at all, it made for a fun distraction and at least made the slight bits of backtracking rewarding. 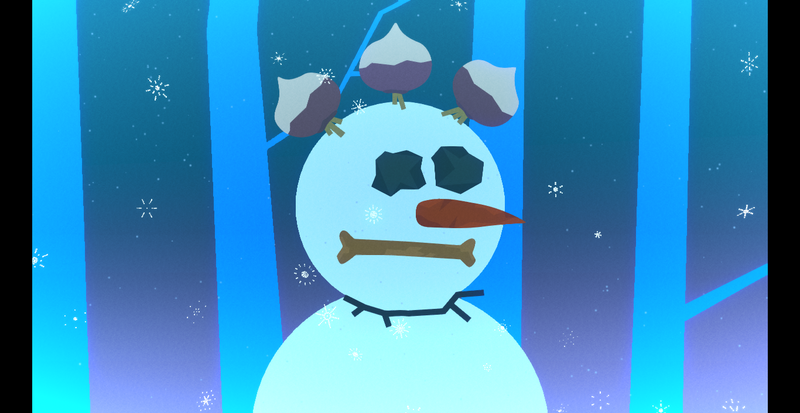 When I watched Giant Bomb play Lost Constellation last week, they found a dog collar for one of their snowmen; I did not, which makes me wonder if there is some randomizing happening under the hood. 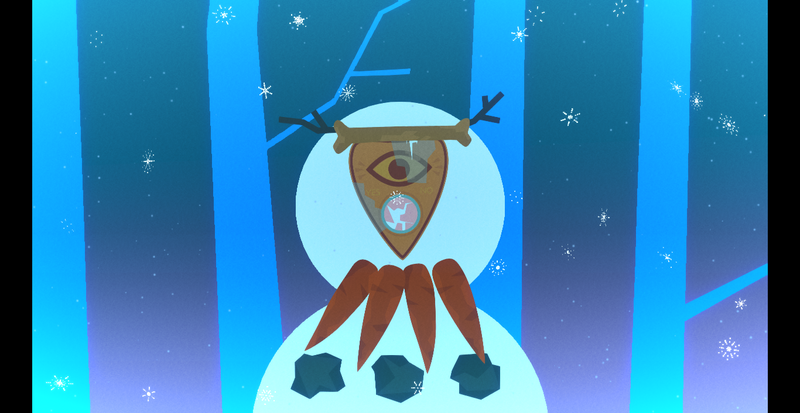 Again, Lost Constellation is a side thing, a slice of maybe what’s to come for Night in the Woods. It has me intrigued over this world and the holiday called “Longest Night” and this astronomer Adina (though not-so-much about Mae). I don’t know everything, but I’m looking forward to learning more, and I have to wonder how much of what is in Lost Constellation will pop up elsewhere. Regardless, here’s hoping for a 2015 release. Or heck, even another pay-what-you-want supplemental. I just want more.